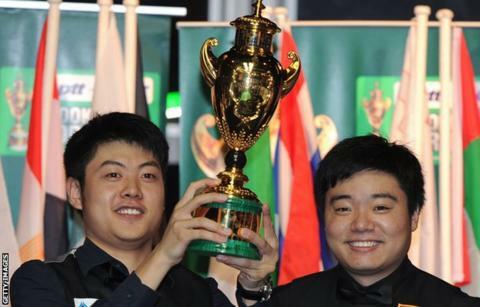 Hosts China A came from behind to beat England 4-3 in the final of the Snooker World Cup in Wuxi. Captain Ding Junhui made a frame-winning contribution of 59 in the decider against Judd Trump. The English pairing of Trump and Barry Hawkins had gone 3-1 in front, but Ding and Liang Wenbo hit back to claim a title they also won in 2011. England reached the final after knocking out holders China B 4-3, while China A defeated Thailand 4-2. Ding said: "In a deciding frame, I don't think I will lose to anyone. I was playing with great confidence, apart from the red I missed in the last frame, but we won in the end. "Anywhere in China, the fans give me massive courage. I used to worry about performing here but I am enjoying my people's passion now, and they give me the motivation to play every shot well." Liang added: "I didn't play well, so I think I put a lot of pressure on Ding. but what he did was reassuring. It is a comfortable partnership between us and there was good chemistry."